This tutorial explains how to set environmental variables and manage user profile in Linux step by step. Learn how to manage user profile (through .bash_profile, .bashrc and .bash_logout files) and perform basic shell operations such as changing shell prompt, stopping logout from CTRL+D and overwriting of files. User's session is controlled by profile files. These files are located in /etc/skel. When you create a new user script files from this directory are copied in user's home directory. There is only exceptions when user is created with –M switch or user home directoy is already exist. In such a situations you need to copy these file manually. These file are hidden and can be seen by –a switch with ls commands. This script file instructs user session to check .bashrc file for user aliases and functions. Further its set user command path . if you want add your own directory to your command path. Edit this file. 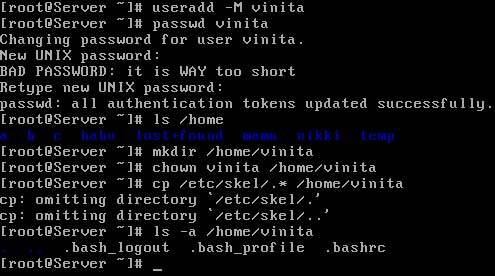 For example user vinita wants her home directory should be check while excuting commands she can add this line in her .bash_profile files. This file is used to controls user variable and other profile during his login session. If you want to execute any command automatically on user logon set that command in this file. For example if user vinita wants to clear screen immediately after her login. She need to add clear command at end of this file. With this file you can play a funny trick with your friends. Create a user and set exit command in his .bashrc files. Now ask your friends to login with this user. exit command will logout the user as soon as user will login and user will never will be able to login. This file is used to clear the terminals after the exit of current user. The BASH shell has several features that enable you to control the way different shell operations work. You need not know all these options for exam. But some hand operations you should always try in exam. Several commands in Linux are completed with CTRL+D. for example if you are making file form cat command the CTRL+D is used to save the files. And if you are using calculator on command prompt then CTRL+D is used to exit form calculators. But what if you pressed accidently CTRL+D two times, it will logout you from current session and you have to login again. Now press CTRL+D and you will get a message “Use “logout” to leave the shell. Now whenever you will try to overwrite it will stop you with error message. Whatever you set with –o option can be revert with + sign. Now again you can logout with CTRL+D. By default shell prompt show user name hostname and current working directory. You can change this prompt to following variable. The superuser command, su, prompts you for the root password before logging you in with root privileges. You can add the users of your choice to the end of this line directly, with the usermod -G wheel [username] command, or with the Red Hat User Manager. The sudo command allows users listed in /etc/sudoers to run administrative commands. You can configure /etc/sudoers to set limits on the root privileges granted to a specific user. To use sudo commands you don't need to give root password. A user with appropriate right from /etc/sudoers can execute root privilege command form his own passwords. Red Hat Enterprise Linux provides some features that make working as root somewhat safer. For example, logins using the ftp and telnet commands to remote computers are disabled by default. You can limit access to the sudo command. Regular users who are authorized in /etc/sudoers can access administrative commands with their own password. You don't need to give out the administrative password to everyone who thinks they know as much as you do about Linux. To access /etc/sudoers in the vi editor, run the visudo command.